A Daemon touched version of The 'Ripley Scrowle' - as seen on the wall in Mary Sidney's lab (and TWOAS illustration). 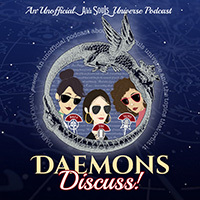 Description: Just like the title states, we explore The World of All Souls together in this bonus episode of Daemons Discuss! 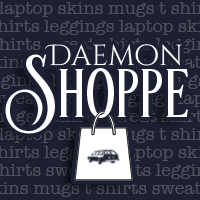 This episode is best described as "Daemons unplugged," because we opted out of our usual production format. Instead, we leaned into a more straight-forward conversation containing our thoughts on the material contained in this official guide to the All Souls Trilogy. ⚠️WARNING! There are spoilers! 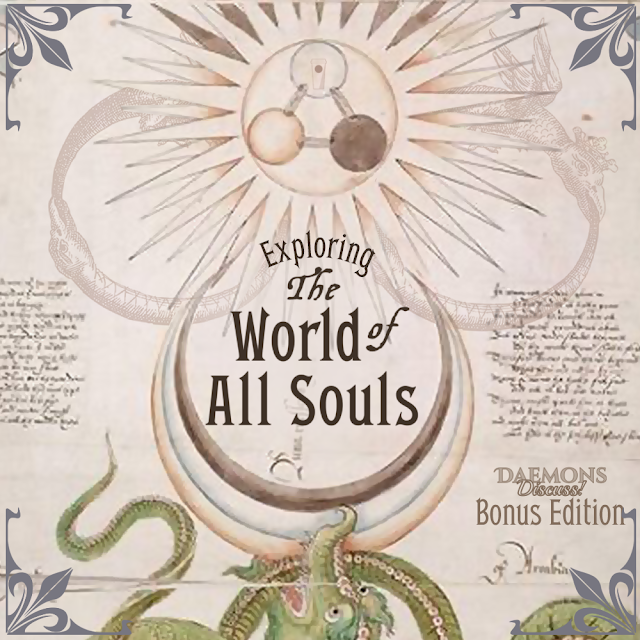 We discuss our impressions of The World of All Souls (TWOAS). If you have not read TWOAS, and don't want to know about it yet, skip this episode. 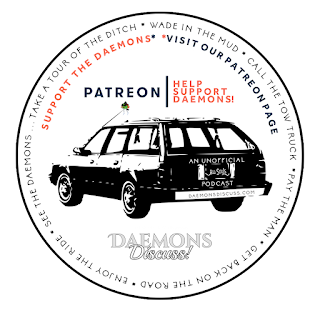 As this is a bonus edition, no other information on other items/current events in the universe or fandom is discussed in this recording. If you don't care either way, enjoy! *Please note - we will freely refer to the information in TWOAS in our future discussions after this episode. Our self-imposed moratorium on open discussion with this particular book will be over as of the 20th of June, 2018. More information on The World of All Souls and Time's Convert can be found on our book page. The picture of Gallowglass' condo that's included in TWOAS can be seen here, and you can take a deeper dive of this location by reading this post! 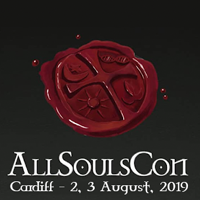 If the All Souls Trilogy is the five-star three-course gourmet meal for the mind, The World of All Souls is the ultimate luscious dessert with the proverbial cherry on top. 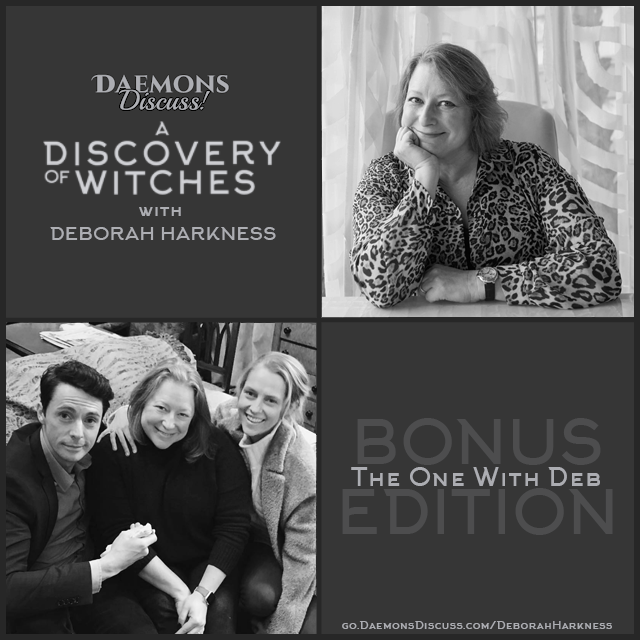 Deborah Harkness and her team of collaborators have combed through Harkness’s author files to bring AST fans a wealth of Bishop-Clairmont & Co. universe knowledge like never before. 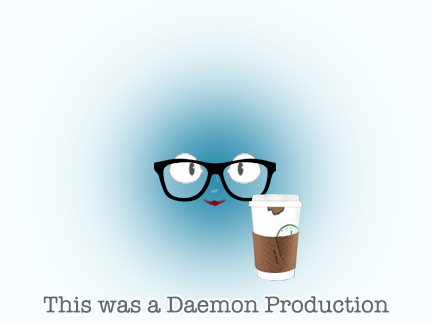 Another crowning achievement of The World of All Souls are the illustrations. They enhance and uplift throughout. They are peppered into the text and on stand-alone pages like a feast for the eyes! The variety at this banquet table is endless. This All Souls anthology is a must have for readers new to this universe, as well as seasoned trilogy bibliophiles. It is also a book that can be referred back to time and again and/or read multiple times – while likely learning something new each time. Perhaps only Ashmole 782 itself could rival this enchanted compendium, but The World of All Souls can be thought of as nothing less than the most “illuminating” manuscript of them all! Imaginary worlds are just as deserving of guidebooks as the real world places we all love, and the All Souls universe now has a Baedecker's worthy of it. The World of All Souls is an amazing guide to my favorite universe. Talk about a swoon worthy total package. It's a work that definitely needs to be savored, and its clever set up allows you pop in to explore a compelling topic or meander through. It's definitely a book I'll revisit again and again. 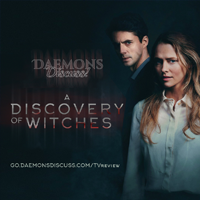 The highlights for me include the character profiles (which include not a few shocking revelations), the outtakes from A Discovery of Witches and Shadow of Night, the literature section, and the lovely discussion of the writing process (a must read for any aspiring author or curious reader). The illustrations range from playful to intricate - ranging from stark and symbolic to high style and artistic. They are so LUSH - even in gray scale. The rendition of Mary Sidney's lab stopped me in my tracks I was so overwhelmed by the detail and thought that leapt from the page. The literature section is especially sumptuous. Between the deftly chosen quotes and illustrations I'll revel in it for hours. Whether you're new to this world thanks to the upcoming TV series or have obsessively chased zebras down rabbit holes for years looking for eggs, this compendium will have something to amaze, delight, and surprise you. It shouldn't surprise anyone - after all, Professor Harkness always has a lesson or two up her sleeve. 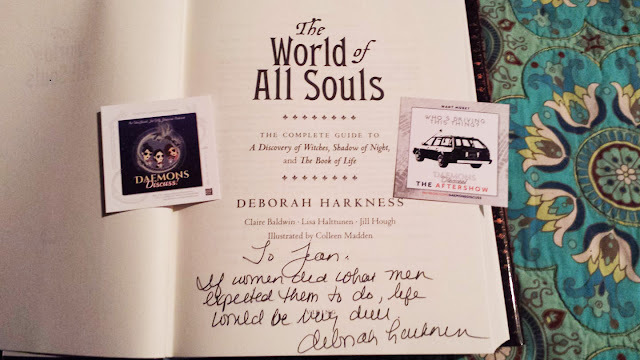 The World of All Souls is the perfect companion to the All Souls Trilogy. 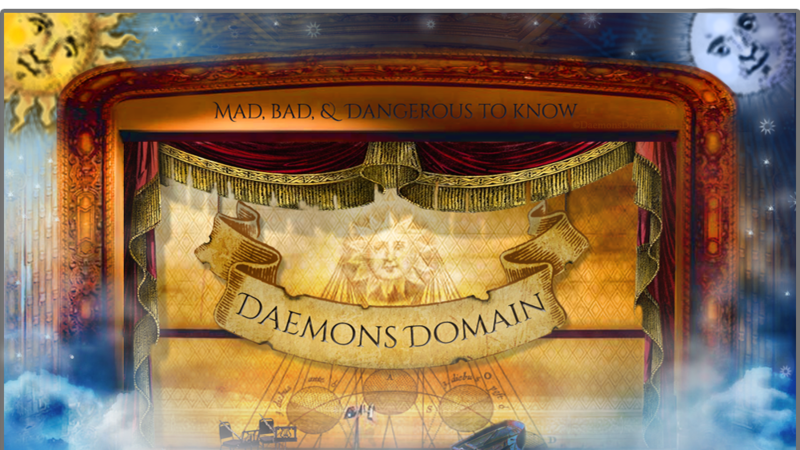 It allows the reader to experience the All Souls universe in vivid technicolor through pictures + information broken down for you by characters, locations, organizations and more. Even though most of the illustrations are presented in black and white, the images jump off of the page to engulf you like magic. As a reader, you will not only get to know the curriculum vitae of the characters, you’ll also get to experience some of the locations mentioned in the books! And this is not just by listing geographical locations, but by exploring the minute details of the places within the locations. Rooms like Mary Sidney’s laboratory are illuminated brilliantly by the illustrator, Colleen Madden. It’s not required reading to the trilogy, but its existence adds priceless value to the overall universe. There are two thrilling outtakes that allow us to read even deeper into the series, while expanding our fascination with the main characters. We are also blessed with insight of some of the beloved secondary characters (who for me, were as, if not more important). This book should adorn any All Souls lover’s shelf, whether they picked up the series in the beginning, or are just now discovering the series. Highly recommend!